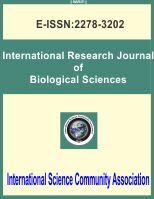 International Science Community Association are publishing an international peer reviewed journal International Research Journal of Biological Sciences. It is the vision of International Science Community Association to publish research papers, research articles, review papers, mini review, case study and short commutations in all areas of human study without financial restriction. Coverage Area: Researches in the field of biologycal science such as Agriculture,Animal Sciences, Botany, Bio Chemistry, Biotechnology, Bioinformatics, Cell biology, Cryobiology, Ecology, Ethno-biology, Food technology, Forestry Sciences, Fishery Sciences, Forensic Sciences, Genetic Engineering, Home Sciences, Life Sciences, Molecular Biology, Microbiology, Medical Sciences,Nanotechnology, Pathology, Pharmaceutical Sciences, Toxicology, Veterinary Sciences, Zoology etc..